Gearbox’s PAX East panel hasn’t even started yet, and we’re already getting Borderlands reveals – though this probably isn’t the one you were looking for. 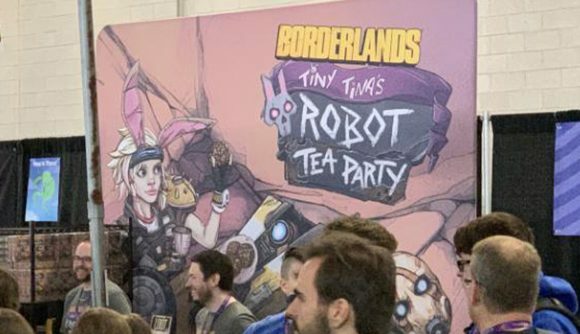 Borderlands: Tiny Tina’s Robot Tea Party is a card game. As in a physical one, which you play with real cards. It’s a small box set coming courtesy of XYZ Game Labs, and it actually does give us tiny a hint or two about what’s coming in the Borderlands 3 reveal. As some pictures of the box show, it’s a game for up to five players where you try to be the first to put together a properly decked-out Claptrap. You can see the images in closer detail via ResetEra. The most notable bit is that Tina herself has the older, bunny-eared look we saw in the teaser trailer, so this is probably what she’s going to look like in proper Borderlands 3. Of course, that sequel is what everyone’s really hoping to see today, and the Borderlands reveal stream is set to happen in just a few minutes. Hopefully that means a Borderlands 3 release date, and since Randy Pitchford is apparently hanging around the panel in shirt with a bejeweled ‘3’ on the back, anything else would be cruel. Stick with us in the hours to come as we learn much more about what Gearbox has in store for Borderlands. Unless it’s just this card game. That would be a heck of a magic trick.